This seminar is only available in Japanese. 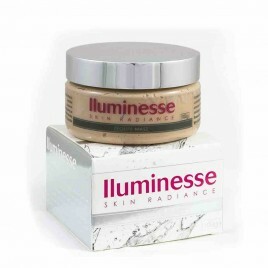 Reduces Hyper Pigmentation, promotes skin lightening, whitening and smoothing. 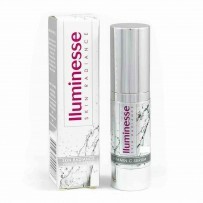 Deep penetrating serum that leaves your skin soft, supple and radiant. For daily use and after mud mask applications. Unique 'Delete & Deliver' properties (withdraws toxins and + beneficial ingredients). All age groups. (Including Allergic, Acne and Dermatitis condition skins). A totally new and unique cleansing product utilising zeolite’s natural ability to absorb and purify. This all natural masque deeply cleanses and detoxifies the skin. The zeolite concentrate, the bentonite and kaolin clays, act together to give the masque exceptional absorbent qualities which are then able to draw out impurities in and on the skin, The zeolite, utilising its renown ‘cation exchange capacity’ exchanges minerals and nutrients into the skin whilst absorbing from the skin its contaminating pollutants, impurities and toxins which have accumulated over time in the skin’s surface layers. The mask is a super absorbent and gentle exfoliator, hydrating and softening the skin while removing dead skin cells. This action helps to unclog pores, reduce bacteria and nourish, tone and heal on and below the skin’s surface. 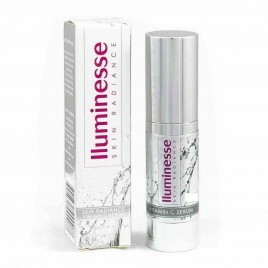 It has anti-ageing properties through its natural beta-carotenes which mop-up free radicals and speed up the cell renewal process by thickening the outer skin layers and retarding the free radical damage to elasticity and collagen structures within the skin. It produces a cooling and calming sensation which assists in reducing redness and relieves skin irritations. The skin will feel like it is being toned and tightened. After treatment, dull skin will be smoother, feel cleaner and look clearer, Use the face mask in conjunction with our Seaweed Extract Lotion for a perfect skin treatment. The mask is suitable for all skin types and should be used particularly for the face, neck, and shoulder areas. Thoroughly clean and then wet the skin area to be treated. Apply the masque with the fingers over the pre-wet area so that the skin is completely covered by the mask. Check by using a mirror. Try to keep the mask away from your eyes. It will not damage the eyes but if accidently inserted into the eyes it may sting a little and feel gritty. If this occurs simply wash the eyes in clean water and any uncomfortable sensations will reduce and then disappear. If to be used over larger areas it may be easier to treat several smaller areas one after another. Let the mask slowly dry on the skin. There will be a distinct sensation of the skin tightening as the mask dries out. Once the mask is completely dry, leave on the skin for a further ten to fifteen minutes. After ten to fifteen minutes gently removed the mask using wet fingertips and/or a wash cloth. Again be careful of eye areas. Due to the submicronisation of the zeolite concentrate, the mask contains no harsh granules which may abrade the skin’s surface. Once the mask is completely removed wash the area with clean water and pat dry. The skin will feel smoother, cleaner, softer and have a radiance about it. The treatment may be repeated once a week. The skin radiance zeolite mask comes in a 100g screw top jar. Simply store at room temperature. Unique 'delete and deliver' properties (-toxins and + beneficial ingredients). Recommended for all age groups and all skin types (Including allergic, acne and dermatitis condition skins). Recommended for all cosmetic procedures, IPL, omnilux, laser treatments, surgery and other less invasive procedures. Deeply cleanses and helps purify the skin. Removes heavy metals and other toxins from the skin. Removes airborne pollutants and irritants from the skin smog, industrial chemicals, petroleum (and other motor vehicle pollutants), the dulling effect on skin from cigarette smoke (nicotine discolourations). Reduces airborne irritations and allergic reactions (pollen deposits). Restores a healthier pH balance to the skin. 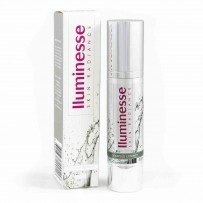 Promotes healthier skin to allow anti-oxidants to work more efficiently. Cooling and comforting to troubled, angry skin. 2-Way Action-Can be 'rinsed off' or very gentle 'rub off' whilst still moist on the skin. The latter provides a very gentle, but very effective 'exfoliator' without the need for AHAs, BHAs or harsh granular scrubs. EVOHE all natural Signature Blend is a delicately balanced formulation that is compatible with the skin’s natural sebum. By feeding the skin with omega rich oils, a balance can be experienced. The 3.6.9 Omega is brilliant for all seasons and light enough to use throughout summer. sprinkle Evohe Colours Mineral Powder and mix. This blend creates a beautiful, silky liquid foundation with a dewy finish. *Indicates Certified Organic Ingredients: 98% of ingredients in this product are Certified Organic. A calming treatment for skin that requires a little extra TLC. This potent antibacterial formula protects, relieves and soothes chronically irritated, dry and sensitive skin conditions. 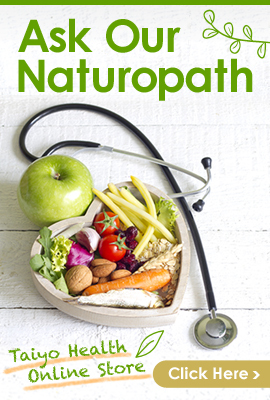 Using potent naturopathic grade herbs and enriched with Calendula, Goldenseal, Gotu Kola and Green Tea Extract, valued for their healing, antibacterial and anti-inflammatory properties. This deeply nourishing skin treatment helps calm, soothe and repair chronically irritated, dry, and sensitive skin while replenishing critical moisture levels. *Apply to clean skin at least once daily as a moisturiser or twice daily as treatment cream. * Excellent as a spot treatment for blemishes. * Can be used in conjunction with EVOHE Colours to create a custom liquid foundation. Mix in the palm of your hand and apply with fingers or brush for a matte finish. * Can be refrigerated to cool and soothe irritated skin. On application to dry, cracked or sensitive skin, you may experience a slight tingling sensation from the active botanicals. This feeling will pass. *Aloe Vera, Colloidal Silver, *Shea Butter, *Cocoa Butter, *Mango Butter, Candellia Wax, Glyceryl Stearate Citrate (Palm Free), Xylitol NGMO, Leucidal (Preservative), *Calendula Extract, Gotu Kola Extract, Golden Seal Extract, *Green Tea Extract, *Rosemary Extract, *Sage Extract, *Burdock Extract, *Yarrow Extract, *Nettle Extract, *Horsetail Extract, *Jojoba Oil, Sea Buckthorn Oil, Totarol, *Rice Bran Oil, *Pumpkin Seed Oil, *Rosehip Oil, Natural Vitamin E, Acacia Senegal Gum, Xanthan Gum, Tea Tree Leaf Oil, Citric Acid (pH adjuster). Australian Bush Flower Essences Blend: Blue Bell, Billy Goat Plum, Spinifex, Sunshine Wattle, Five Corners, Slender Riceflower. Our all-natural Silica Mask is enriched with the skin refining properties of Australian Mineral Clay and Nutritious Green Superfoods that purify skin texture and firm skin tone, delivering essential building blocks for skin health and vitality. Beneficial for all skin types. Hailed as an EVOHE favourite, our Silica Mask is a unique blend of White Clay and Silica, with soothing botanical extracts that work wonders on uneven skin. These potent ingredients work to gently buff away dead skin cells allowing moisture to penetrate, leaving skin soft and lifted. *Cleanse face thoroughly and pat dry. Apply an even layer of Silica Mask to damp skin. Leave on for 15 minutes then massage to create a flaky, granule effect before rinsing off with warm water. Follow with the EVOHE skincare regimen, including EVOHE Mist and Omega 3.6.9 or Repair Intensive. *Silica Mask can also be used as an overnight acne treatment in combination with Repair Intensive, or as a rich hydrating mask when used with Omega 3.6.9. Perfect for all skin types and gentle enough to use daily. 100% Natural Parfum Blend: Sandalwood Essential Oil, Balsam Peru Essential Oil, Tonka Bean Absolute. A unique foaming formulation which harnesses the powerful regenerative potential of Amaranth, removing impurities and restoring skin's youthful smoothness. *A gentle foaming cleanser that harnesses the hydration of Organic Coconut Oil, the regenerative power of Amaranth, and the natural antibacterial properties of Colloidal Silver. EVOHE Foam Wash will naturally remove impurities, to leave your skin clear and toned without stripping natural oils from your skin. Uniquely beneficial for all skin types, and gentle enough to use all over. *Apply 1-2 pumps of the Foam Wash in your palm and lather onto damp skin. Massage for thirty seconds then rinse. Especially effective in removing makeup. *Use as shampoo, shaving cream, hand wash or bath wash for babies (apply to bath water). *Rice Bran Oil, *Pumpkin Seed Oil, *Rosehip Oil, Cocoyl Proline, Tea Tree Leaf Oil, Citric Acid (pH adjuster). Often binders, preservatives and stabilisers are used in ‘ready-made bottled’ foundation. With EVOHE Colours you have just pure minerals, and pure oils, NOTHING else. Step 3 Using your fingertips, blend the powder and liquid together. Apply to your face by gently massaging/blending into the skin. The result is a dewy, sun-kissed, natural glow! EVOHE Colours foundation can also be mixed with our Moisture 24/7 Lite (for a matt finish) or Repair Intensive (perfect for inflamed, sensitive or acne prone skin). 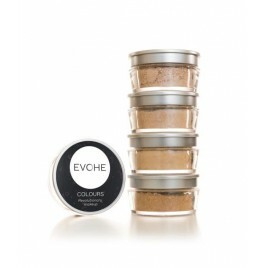 EVOHE Colours can also be applied dry as a powder foundation. There are no rules with EVOHE – just choose what feels right for you! Acne or inflamed skin conditions enjoy great results from blending the powder with Repair Intensive which sits nicely around an area of breakout while most foundations will ‘cake’ around the affected areas. A small amount of Omega 369 with the Repair Intensive allows for easier blending and is also a great combination for wound healing. Acne should be treated like a wound and this will help to avoid scarring. The Repair Intensive contains potent antibacterial and anti-inflammatory herbs. - Omega 3.6.9 – general use (for the ‘EVOHE glow’). - Repair Intensive – for inflamed skin prone to breakouts. - Omega Body – blend bronze with Omega Body and apply. You will be impressed by how natural and sun-kissed the finish is. ・We recommend using one pump of the above products. Adjust the desired coverage with more or less powder. ・Mix your own concealer, using fair or med/fair, with your chosen combination of Moisture Lite, Mist, Omega 3.6.9 or Repair Intensive to make a paste or sticky like texture to pat over dark circles or blemishes. Can also be used to conceal tattoos, birthmarks and scars. Then apply your foundation mix to rest of face. ・Dry powder application: EVOHE mineral powders can be applied dry, however, do not use too much powder as this can create a dry powdery look. Powder should be embedded in the brush, NOT sitting on the surface of the brush. Tap the brush to remove excess. DO NOT blow on the brush, as this is not hygienic. TIP! Always start with a smooth, clean canvas. Use Silica Mask 1-3 times per week to keep a perfectly smooth base for your foundation. *Organic Kaolin clay, Mica, Titanium Dioxide, Zinc Oxide, +/- Iron Oxides, Ultramarine Blue, Tin Oxide. *Patch test before use, do not ingest, use within 24 months of opening. Eat your way to healthy skin, hair & nails with our delicious organic wholefood snack bars, containing Collagen Beauty with Verisol®, Vitamin C, Zinc, Horsetail Herb and Protein. Collagen Beauty's specific Bioactive Collagen Peptides can be easily incorporated as part of your healthy diet to help reduce wrinkles and improve skin elasticity & hydration to decrease the signs of ageing. Collagen Beauty Bars also contain a source of Vitamin C to assist with collagen syntheses and Zinc to support healthy hair & nail structure. Each Collagen Beauty Bar contains 1 serve of Verisol® Bioactive Collagen Peptides. 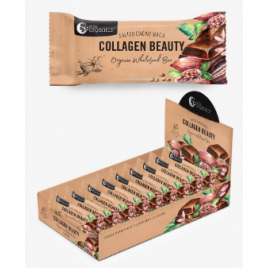 Collagen Beauty Salted Cacao Maca Bars also contain Hemp Protein Salted Cacao Maca, vegan Belgian 74% dark chocolate, hemp seeds, desiccated coconut, and is sweetened naturally with rice malt syrup and date paste. No nasties or artificial ingredients whatsoever, just pure, organic, wholefood goodness. Our home compostable packaging is plant based, predominantly made from sustainably harvested eucalyptus trees. For every tree harvested, another tree is planted. They are sourced from FSC (Forest Stewardship Council) accredited sources. The material has no eco-toxins, is non GMO, and not derived from fossil fuel sources. Fitting into the circular economy, our packaging breaks down in 26 weeks returning nutrients to the soil, perfect for your home compost to nourish your garden. The Packaging is certified 100% home compostable by: ABA (Australian) and TUV (international) which means the packaging has been through rigorous testing processes to ensure the materials break down to their natural components within 26 weeks, and the soil is tested to be completely toxin free with no material left that can be distinguished from the compost. Brown Rice Malt Syrup*, Belgian 74% Dark Chocolate Buttons (20%) [Cocoa Mass*, Sugar*, Cocoa Butter*, Vanilla*], Hemp Protein Salted Cacao Maca [Sprouted & Fermented Pea Protein*, Hemp Protein*, Peruvian Maca* (2%), Raw Cacao* (1%), Brown Rice Milk Powder*, Himalayan Salt (0.3%)], Collagen Beauty (14%) [Verisol®, Hydrolysed Collagen, Camu Camu*, Orgen-Zn® Guava*, Horsetail Herb*], Desiccated Coconut*, Coconut Milk Powder*, Date Paste, Hemp Seeds*. Allergen Warning: Despite our very best cleaning efforts, may contain traces of tree nuts, peanuts, milk products, egg or soy due to shared processing equipment. Eat all at once, take on the go in a handbag or consume as a healthy after dinner treat. 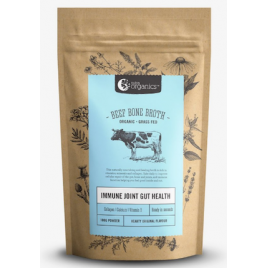 Beef Bone Broth Hearty Original is naturally nourishing with a source of protein and collagen, Zinc and B vitamins to keep you feeling satisfied and energised. 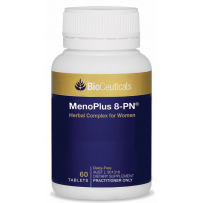 MenoPlus 8-PN® is a unique herbal formula containing herbs and nutrients including Lifenol® 8-PN, a phytoestrogen clinically demonstrated to reduce the incidence of hot flushes associated with menopause. The formula now features zizyphus and lavender oil, as well as multiple standardised herbal ingredients. MenoPlus 8-PN® includes sage used in traditional western herbal medicine (WHM) systems to relieve night sweats associated with menopause, hops and lavender traditionally used in WHM to assist with sleep, vitamin C to support nervous system function and vitamin D to support bone health. ・Features clinically-trialled Lifenol® to relieve hot flushes associated with menopause. 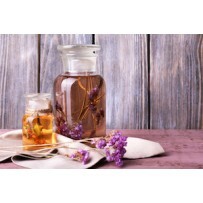 ・Contains a broad range of herbs including rehmannia, zizyphus, and standardised hops, lavender, sage and shatavari. ・Hops and lavender are traditionally used in WHM to assist with sleep. 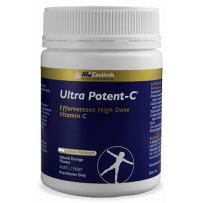 ・Vitamin C supports nervous system function and helps to relieve tiredness, fatigue and feelings of weakness. ・Vitamin D helps to support bone health. ArmaForce ImmunoBurst are chewable capsules of echinacea in a blend of honey, eucalyptus oil, peppermint oil, menthol and lemon oil. It contains standardised echinacea root that is processed from fresh plant and standardised for potency. 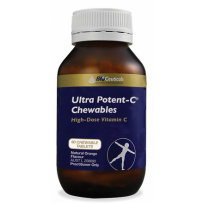 These fast acting liquid chewable burstlet capsules are designed for immediate release in the throat. Fast-acting liquid chewable burstlet capsule for immediate release in the throat. With Manuka honey, eucalyptus oil, peppermint oil, menthol and lemon oil. Echinacea is traditionally used in western herbal medicine (WHM) for the relief of symptoms associated with mild upper respiratory tract infections, including the common cold. 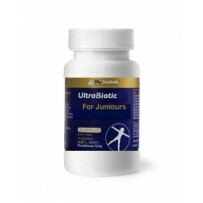 Contains standardised echinacea root and provides the daily dose required for traditional therapeutic use. In WHM, echinacea helps to enhance immune system function. Adults: Chew 2 tablets three times daily or as directed by your healthcare practitioner. Not suitable for infants under the age of twelve months.